Andrew Haigh directs a story about a boy (Charlie Plummer) who befriends a horse marked for slaughter. 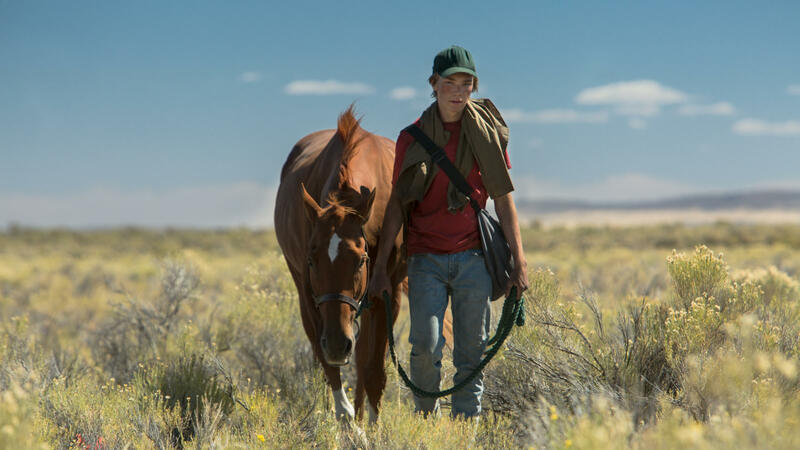 A boy-and-his-horse drama that's not designed for horse lovers, Lean on Pete is a movie in two parts. The first and better half is melancholy, but with encouraging glimmers of humanity. The second chapter is mostly grim, and when it finally offers a sort-of-happy ending, few viewers will be in the mood to accept it. The film is distinguished by a sensitive lead performance from Charlie Plummer (the hapless kidnapping victim in All the Money in the World) and effective if well-precedented turns from Steve Buscemi and Chloe Sevigny. As its scenario goes from sad to worse, though, the movie seems to aspire only to bumming everybody out. When we meet gawky, half-lost 15-year-old Charley (Plummer), he has no mother and not much of a father. Ray (Travis Fimmel) is more like a friendly but irresponsible older brother, too busy chasing women (including married ones) to pay much attention to the kid. Some of Ray's temporary girlfriends offer Charley a semblance of maternal affection, but by now the boy knows they won't be around long. Since he and his dad just relocated to Portland, Oregon, Charley is friendless. (The era is unclear, but the boy doesn't appear to have Internet access to any of his acquaintances.) Charley is drawn to the shabby racetrack near his new house, and soon finds himself working part-time for Del (Buscemi), who ekes out a living by racing a few past-their-prime horses. One of them is named Lean on Pete. Aside from lecturing Charley about his feral style of consuming meals, the boy's crusty new boss doesn't show much potential as a surrogate father. Charley gets more warmth and guidance from Bonnie (Sevigny), an almost-washed-up jockey who warns him not to become fond of any of the horses. "You can't think of them as pets," she says. Charley does anyway, and when Del decides to send Lean on Pete to an unspecified but probably equicidal new owner, the kid stages a rescue mission. Charley's goal is Wyoming, where he hopes he and the horse will be sheltered by a fondly remembered aunt (Alison Elliott) he hasn't seen in years. The trip, which plays as series of dispiriting episodes, doesn't work out quite as planned. More than a hour before the film's end, alt-country-savvy viewers will probably have already guessed that the credits will roll under a doleful ditty by Bonnie "Prince" Billy. Lean on Pete is based on a novel by Portland author and country-rocker Willy Vlautin, but was scripted and directed by Andrew Haigh, a Briton who's strictly attuned to the deceit and despair in the American experience. Moments of camaraderie are always fleeting or false, whether it's Charley's friendship with Bonnie or his alliance with a homeless man (Steve Zahn, playing against goofball type) whose amiability soon turns toxic. The director's style is austere and terse, and for much of the movie Charley has only a horse to talk to. Plummer's intense yet unmannered presence does convey much of the kid's yearning and confusion, but his motivations are a little harder to discern. It's telling that Danish cinematographer Magnus Jonck gives the Oregon landscapes a wintry feel, although the story is set in summer. Even those who aren't devastated by Lean on Pete are likely to exit the movie feeling a bit of a chill.